tag: BeYouBling: AMAZING changes at Paparazzi Accessories!! AMAZING changes at Paparazzi Accessories!! There are so many amazing changes that just started. Here are just some of the highlights. *EVERY CONSULTANT now has their own retail website from which customers can order. *Customers can have access to approximately 800+ pieces of beautiful Paparazzi 24/7!!! 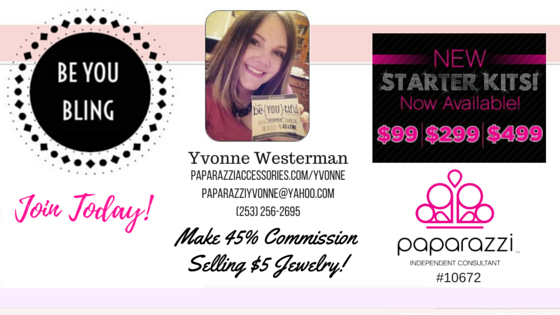 *Paparazzi will ship directly to customers and still payout a 45% commission to consultants! *Starter kits have improved and lowered in cost! Check out my website at www.paparazziaccessories.com/10672 to see some of the new fall jewelry that was just released. It's beautiful and still only $5! Please send me an email at paparazziyvonne@yahoo.com if you have any questions about this fantastic opportunity. I have a very active team that I take great pride in supporting. I would love to help you get started with this amazing company.